Will Ferrell is the go-to guy if you want to laugh your-self silly. He could just stand there staring at you and get you giggling. Then there’s Zach Galifianakis, a smart actor with a natural clown’s gift for playing dumb. 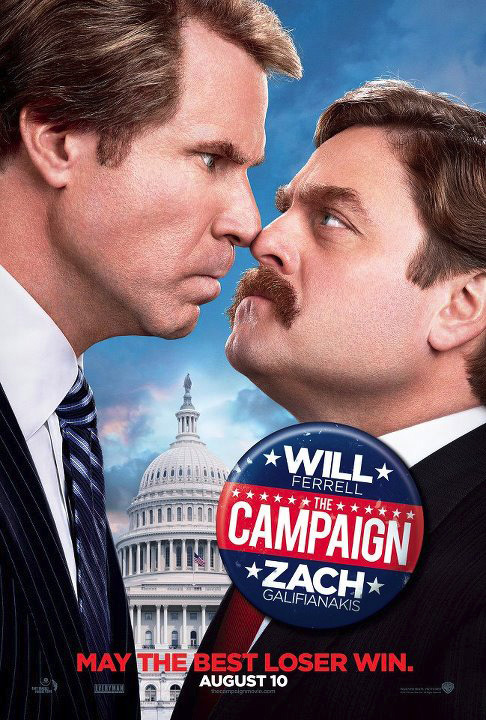 Both actors rip off each other with inspired lunacy in “The Campaign”, playing candidates for an upcoming election. Who you gonna vote? Ferrell, a smug but stupid Congressman from North Carolina or his unusual competitor (Galifianakis), who is utterly unprepared for the job, and doesn’t have a clue? Hilarious premise. And then the fun decides to a stop after the hour mark. You know how it goes: Plot gets in the way. Somebody decides it’s time to get all repetitive and predictable. Too bad. But until then, “The Campaign” is seriously funny. It slaps a goofy smile on your face as both candidates play it dirty. Is it too much? Sometimes. The movie can be silly, shallow and way too inside. But how do you hate on a film that is willing to do anything for a smile? Plus, there is a shrewd method to Ferrell’s madness. He knows firsthand that politics is a microcosm for a world that has swallowed its own marketing strategy . Every character in “The Campaign” is delusional. That’s why the movie feels a lot like a satire. Having given up on truth, they still do their damnedest to fake it. We enter this bizarro fun house giggling at the clowns on view, but we exit , and here’s the fun part, laughing at our own politicians. No need to analyze more; just enjoy.